Hey we have more videos, this time of the Motorola LI2208 scanner. While the first video showed us trying to break the scanner, this one covers more of the functionality of the scanner. It’s a very functional scanner. I really do like the “Auto-Aim” mode as a means to improve accuracy, especially with how fast the scanner is. And that 3-foot scan range for regular retail barcodes is going to make it wicked easy for anyone to get a good read. Motorola just announced a new scanner, and I finally get to tell you about it. The Motorola LI2208 is their new linear imager, fitting in the same arenas as the LS2208. 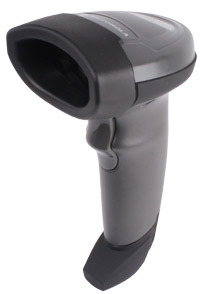 But the scanner offers unparalleled performance and should stand out for quite some time as a top retail barcode scanner. Linear imagers are finally starting to catch up with laser scanners in terms of price and performance, which is terrific. There aren’t too many ways you can tune a laser before you start melting holes in plastic bags, and some people freak out when lasers get near their face. So the LI2208 is a great step in expanding features and functionality for medium to high volume scanning. For regular UPC barcodes, you can get reads from an inch to about three feet away. Even if you’ve never used a barcode scanner before, you should be able to competently scan with the LI2208. I think the only person who might have trouble with it is like a feral person who was raised by wolves. They might try to chew on it. What really stood out to me was the LI2208’s ability to scan barcodes on LCD screens. Imaging technology has grown in leaps and bounds since I started working here. It used to be that barcodes would have to be enlarged 400% just for the imager to maybe possibly get a read off an LCD screen. With the LI2208, we were able to scan un-enlarged six mil barcodes off a screen with no issues. Auto sense stands are available for the scanner in case you want presentation scanning. There is also an Auto-Aim feature, where the LI2208’s beam is constantly on but won’t scan until you pull the trigger, dramatically increasing accuracy. This might not seem like a big deal, but for manufacturer part barcodes, like the umpteen that are on any given smartphone box or hard drive, being able to line up the shot is awesome. In terms of durability, the LI2208 offers a similar build quality of other high-end retail scanners. It’s lightweight and has some rubber on it, so you can drop it from six feet to concrete and it’ll keep on scanning. I don’t know why it’d be six feet in the air in the first place, but I guess knocks off counters won’t harm it at all this way. It also sports an IP42 seal, which means some dirt and water splashes won’t affect internal components, but I wouldn’t tag this with a hose or throw it in the ocean. In all, this is the next scanner to get if you don’t want to worry about replacing it in the near future. It’ll work just as well in low volume retail establishments, outdoor garden centers, and even high volume department stores or grocers. Scanning on LCD screens is terrific if you want to add mobile couponing, but don’t necessarily want to take the full plunge into 2D scanning as well.